October is the month we start to see Hill Country colors on our beautiful Spanish oaks and we hope for cooler weather. The vans and trailers will be arriving in town ready to exhibit some of the best Americana antiques available in the market today. 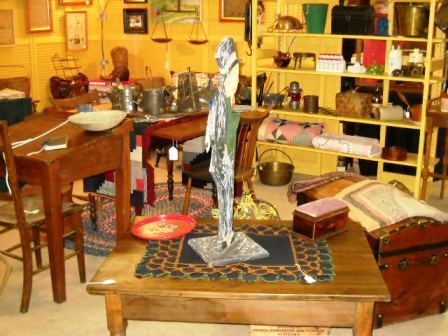 We have been asked why our Hill Country Antiques Shows are so popular and there are many answers to that question. First answer is that our dealers make the difference. They arrive with smiles and knowledge, both of which they share with the collectors coming to the show. The hospitality of the neighbors and businesses in Comfort welcome them and the true country setting is a treat from the hectic city shows. Our exhibitors are qualified to answer questions about the antiques they bring to the show and represent them with honesty. Because they are all collectors themselves, they share a love of antiques. The show features Americana antiques, including farm tables, cupboards, quilts, rugs, baskets, pewter, and many interesting surprises. We are also happy to have qualified dealers in jewelry, china, Native American items, old store collectibles, advertising, architectural, and gardening pieces. The public can sit under the large food tent, eat and visit, and discuss the treasures they are going home with. Collectors as well as decorators visit the show and bring clients to help with their purchases. The happy noises heard at this show remind us of the shows "of old" when people truly had a good time.